Thousands of devotees had gathered in Delhi to celebrate the Rajat Pratishtha Mahotsav of Shree Swaminarayan Temple Delhi. Acharya Swamishree arrived at the sabha mandap at precisely 7.30. Shree Muktajeevan Pipe Band led His Divine Holiness Acharya Swamishree and the Sant Mandal from the sabha entrance to the stage. “All the people in this world are seeking happiness. No-one wants suffering or pain. Everyone believes that one can find happiness and contentment through worldly matters such as money, television, or cinemas. However, Lord SwaminarayanBapa Swamibapa says that this is not the way to reach happiness. Everyone needs to wake up from this age of self-contentment and self-indulgence. Only then will we gain true happiness. “Through being hard hearted, one may become wealthy, scholarly or gain great power; however, to become virtuous, you must make your heart like a lotus; the lotus is a symbol of purity and compassion. Your heart should be like this. Then, the supreme Lord SwaminarayanBapa Swamibapa will come and reside within you. “I am currently president of the Bharat Sadhu Samaj, a role that previously belonged to Guru Shree Muktajeevan Swami Maharaj. But I am not the true successor of Shree Muktajeevan Swamibapa, that honor has been bestowed upon your Pram Pujya Acharya Swamishree. “Shree Muktajeevan Swamibapa was a great and respected leader of our organization; His inspiration and enlightenment were unparalleled. Today, I see those very same qualities in Acharya Purushottampriyadasji Maharaj. Shree Muktajeevan Pipe Band then welcomed and saluted the Mahotsav's main guest; the Vice President of India, Shree Bhairon Singh Shekhawat. The Band led the honorable Vice President to take His seat next to Acharya Swamishree, Shree Harinarayan Swami and Shree Vijaybhai Chopra. A special nrutya was inspired by Acharya Swamishree to the patriotic song “Jaha daal daal ki soni ki chidia.” The nrutya was performed by Shree Muktajeevan Swamibapa's sants and students of Shree Swaminarayan Chatralaya and expressed the divinity if the motherland. The title literally translates to “everywhere the branches are filled with golden sparrows.” The song describes the sovereignty of India ; even the sparrows are made of golden. 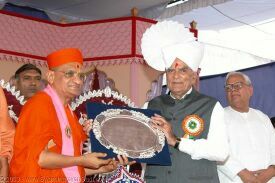 Shree Harinarayan Swami then presented a special trophy to His Divine Holiness Acharya Swamishree on behalf of the Bharat Sadhu Samaj. The text on the silver platter trophy expressed the prayers of the Sadhu Samaj and the earlier words of Shree Harinarayan Swami. “I have been to many religious functions and ceremonies around the world, but the pioneering efforts of the Swaminarayan Sampraday in inspiring social reform are truly unique. “I too am a disciple of Lord Swaminarayan, and so when I come for the darshan of Param Pujya Acharya Swamishree, I truly feel at home. The role of Master of Ceremonies (M.C.) during this extraordinary assembly was eloquently performed by Sant Shiromani Shree Gnandivakardasji Swami. At the end of the assembly, Trustee Shree Vasantbhai Patel expressed his heartfelt thanks to everyone in making the occasion such a great success. The Sabha concluded with thaar prashad being served to the entire sabha. The afternoon sabha commenced with the recitals of the Rahasyarth Predeepika Tika sah Vachnamrut and the Shree Swaminarayan Gadi Granth. During this sabha, all those who partook in the organisation of the Rajat Pratishtha Mahotsav were blessed by His Divine Holiness Acharya Swamishree. Each received a prasanta paag. The honoured volunteers included officers of the Gujarat Samaj who had undertaken all the luncheon arrangements for the Mahotsav as well as those who organised the accommodation and transport matters. Those devotees who had travelled from Africa to have the darshan of this Mahotsav were also blessed by Acharya Swamishree and each received a prasanta paag, saal and flower garland. “God has blessed you all and given you a human body. He has provided you all with a unique opportunity that should not to be squandered. This can be likened to a thunderstorm. During a thunderstorm there is much rain everywhere, but once it has passed, after a short while, there is no sight of there ever having been any rainfall. In this way the supreme Lord SwaminarayanBapa has given you all a human form. You may not get such an opportunity for a very long time. Furthermore, you have been born into the shelter of Shree Swaminarayan Gadi. You must take this opportunity to please Lord SwaminarayanBapa Swamibapa and not waste it. “One must never be lazy in nature, a lazy person's favourite word is tomorrow, but for a lazy person, tomorrow never comes. Swamibapa has asked us ‘when should we praise the Lord?' the answer is today, right now. Religious activities should be carried out straight away without an iota of laziness. The afternoon sabha concluded with the Shree Swaminarayan Mahamantra dhoon. Everyone then received evening thaar before tonight's Bhakti Sangeet event. The first night event of the Rajat Pratishtha Mahotsav was Bhakti Sangeet. The kirtans were performed by an ensemble of singers and musicians renowned in the music and film industry. The singers included Shreemati Vandnaben Vajpai, Shreemati Angeliben Jain, Shree Vipinbhai Sachdev, Shree Rakeshbhai Kala and Shree Shalimbhai Jain. They sang kirtans written by our Nand Padvi Sants and Shree Muktajeevan Swamibapa. The music for this event was directed by Shree Ajaybhai Prasana with the role of Master of Ceremonies undertaken by Shree Rajeshbhai Prince. His Divine Holiness Acharya Swamishree gave His divine darshan throughout the evening's proceedings. At the end of the programme, each of the singers were honoured on behalf of Shree Swaminarayan Gadi Sansthan.